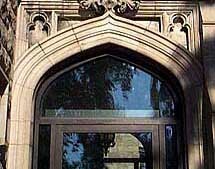 Flat arch/jack arch: a flat arch (as a lintel with a keystone); an arch of the thickness of one brick; an arch whose intrados is flat or almost flat, instead of being curved or rounded. Jack arch lintel: A door or window lintel constructed with splayed bricks. Transverse arch: An arch of the vault that runs perpendicular to the nave that divides one bay - or groin vaults - from another. Harcourt Brace College. Pub. 1996, p. 325. The lower arches [in the Mosque of Cordoba] are horseshoe shaped ... now closely associated with Muslim architecture. Visually, these arches seem to billow out like sails blown by the wind, and they contribute greatly to the light and airy effect of the mosque's interior. Here, the large ribs that subdivide the hemispheric surface of the dome into a number of smaller sections are primarily ornamental. In the hands of Gothic builders, centuries later, ribs in combination with the pointed arch became fundamental structural elements of a new and revolutionary architectural system.